If French Marquetry stands at the pinnacle of labor intensive and complex woodworking techniques, this shop cabinet surely occupies the opposite position. For a while I’ve had a collection of corded tools that didn’t have a home. My router, D/A sander, finish nailer, and others that clustered in a “pile” next to the jointer. With the marquetry I’ve acquired a few more interesting accessories. Two hot plates, a frying pan of sand, hot water kettle, and more.None of these tools had a “forever home”, so I decided to do something about it. 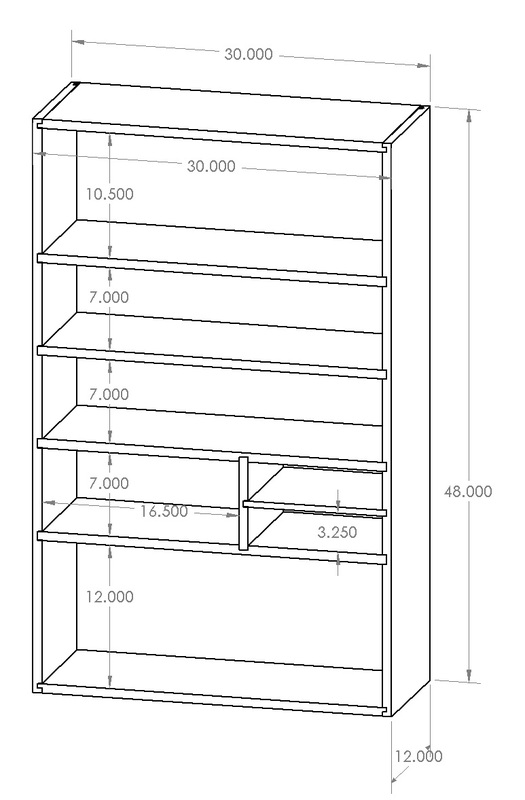 Basic Dimensions for the cabinet — I left out the sub-divider in the end, and of course skipped all of the real joinery in favor of screws. I dragged a couple of sheets of Home Depot Birch plywood back to the shop. I don’t like this stuff. It warps as you cut it, has lots voids and is only 5 layers of material. Next time I’ll get the real stuff. 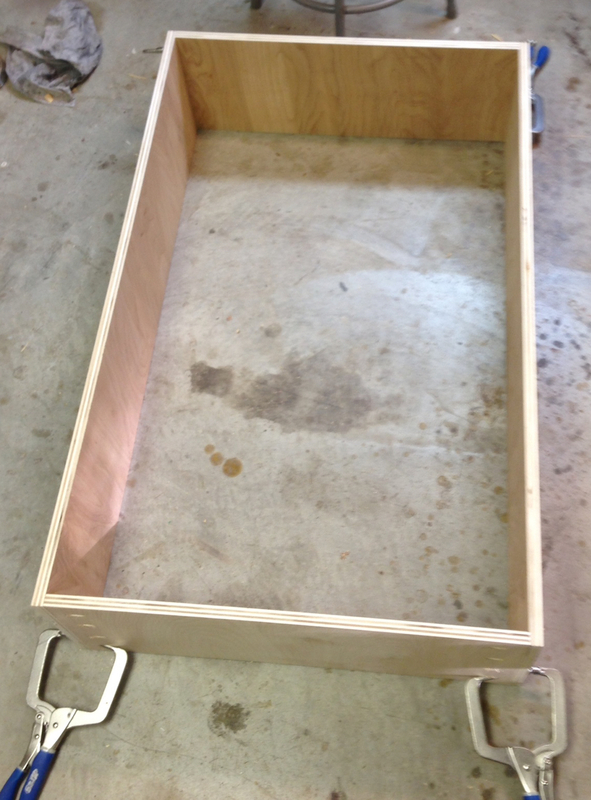 But me and my tablesaw cut it down to size quickly, and with the aid of my Kreg jig I had pocket holes drilled the the outsides clamped up in no time. These clamps are the best thing ever. I think the best thing about pocket holes is the Kreg pocket hole clamps. I’m pretty lukewarm on pocket hole joinery. At least with home center plywood. It’s really easy to overdrive the screws and either strip them out or have the tip tear through the side while the end of the adjoining piece splits while the head wedges it apart. It’s certainly a fast way to assemble something though. Before I even got around to feeling guilty about using such quick0and0dirty construction practices I was done building. This is 30″ wide x 48″ tall x 11″ deep. No dados, no glue, just pocket hole screws for the outer shell and Spax screws through the outer face into the edges to affix the back and shelves. The back is just overlapped. Yeah, cheesy construction, but I was curious if it would be strong enough. 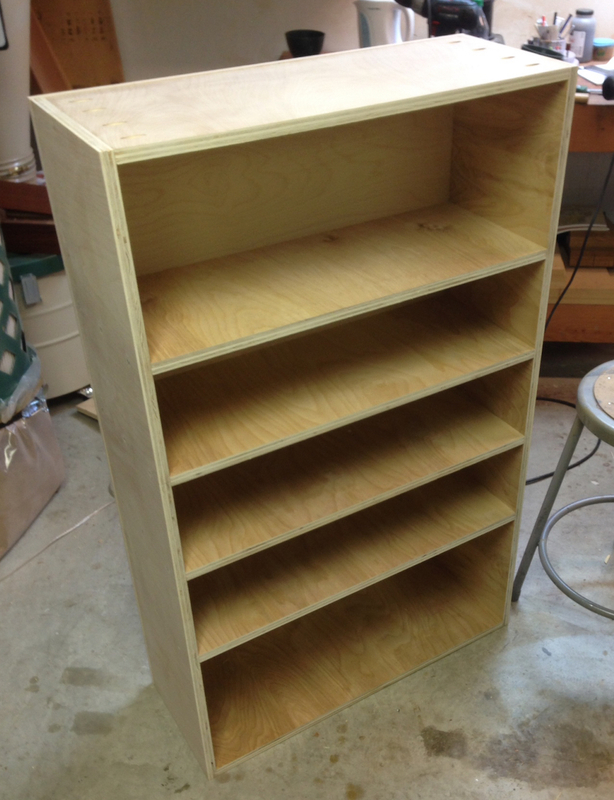 I hate not having the shelves in dados, and not having the back clued into a groove. 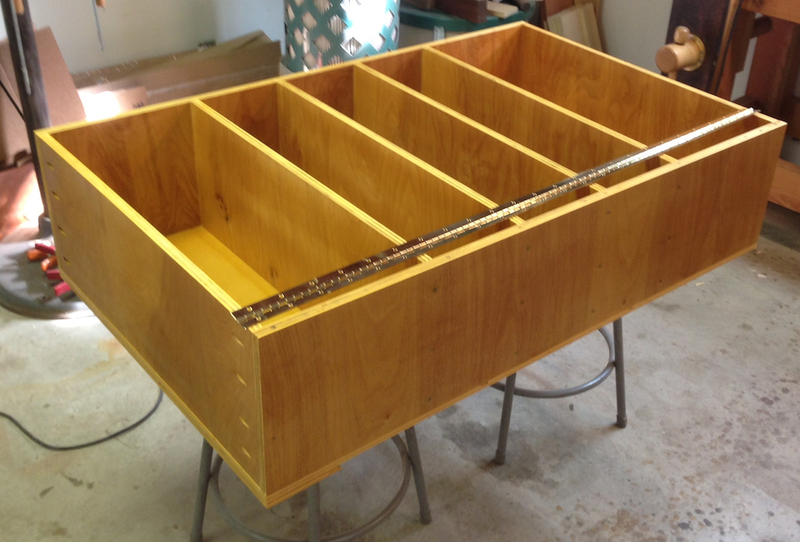 But this went together so quickly, maybe two hours from when I started to cut the plywood until I had the cabinet built. I added a french cleat to the back, and loaded my spray gun with Amber Shellac. 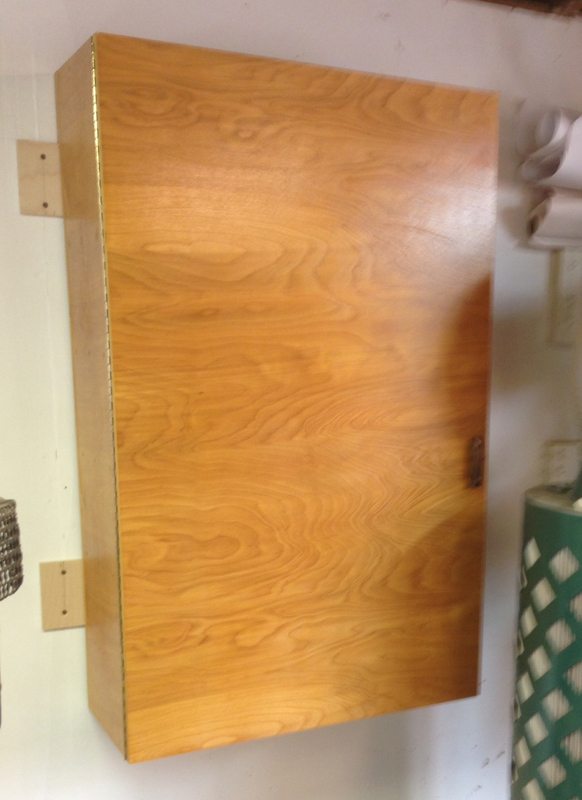 Three coats with the shellac reduced 100% out of the can, and the cabinet was ready to hang on the wall. Just need to hand the slab door and this project is a wrap. The shelves seem strong enough to support the tools, although I wouldn’t want to overload them with (say) 10 years of Fine Woodworking back issues. That would be wrong on several levels. I was able to put all of my homeless tool away, with room for the few that I’m actively using left over. I’ve got a couple of additional organizational projects that I want to do, but this has made a big improvement in shop clutter. Out of focus, but finished, installed and packed with tools.